Yes, you heard that right it’s honey harvest time or sticky door knob season as we fondly call it! It sure has been a while and I have missed posting to all of you but at least lately I have tried to make sure when I do post it’s an exciting topic such as harvesting the honey this is probably one of the most exciting occurrences on the homestead during the year! Not only the honey harvest but we were able to turn this event into a photo shoot with local Wilmington, NC photographer Brian Lantz. The Viking in my life and I have been on “stay”cation the past couple of days and we have been enjoying it thoroughly. I had no idea how much I needed the rest and to some it may not appear that I am resting with all I have going on. For us though when we are working on projects at home that we rarely get to do well we find that quite restful. Between working full-time and going to school part-time it doesn’t leave much time for me to do much else but rest when I have a free minute. We have done all the things we love this week and went out to listen to live music and we visited some of our favorite local Wilmington Breweries; it’s been a fabulous time! I love sleeping in so that was quite enjoyable to! We have also been harvesting elderberries and working on our newest DIY: mobile chicken coop this week. I am so excited to share these photos that Brian took last weekend for us and I know you will fall in love with his work and you can more of his photography at BrianLantz.com and trust me his work is fantastic and it encompasses a wide range of photography not just homesteading shoots. Make sure to stop by his website and check out his work! I was excited that he was going to capture the honey harvest in action and of course the wonderous work of the bees! Make sure to follow Brian on Instagram! Click here. This year we used the fume board with the almond oil to help us in the extracting process. At first I was skeptical that the bees would leave the hive but sure enough they did and then I used the air compressor gun to get the rest of the bees off of the hive/frames before we brought them into the kitchen for honey extraction. If you don’t know what a fume board is well it’s a top board that simply lays on top of the hive and you spray it with an all natural product such as almond oil. This next photo is one of my faves because you can really see how happy my husband is in this photo. We really do look forward to the honey harvest, it is labor intensive but the delight in helping the bees and the reward to our bellies is almost primal. Sugar is not a mainstay in our household but honey sure is and to be truthful we almost want to break out and dance and celebrate it’s very cave man/woman like lol. This was probably our most seamless honey harvest although the bees always still surprise us when we get inside and take a look around. I think us using the fume board was the ticket as we have struggled in the past getting the bees out of the hive just using the brush method. We also used an air compressor that I sprayed the bees pretty gently to get them out between the frames as you see below. Isn’t it amazing what the bees produce? My favorite part of the honey harvest is the beautiful aroma that lingers in our home for days and it’s just a delight to wake up too! My least favorite part is stepping barefoot into a nice pool of honey on the floor lol….you gotta’ take the good with the bad. Last weekend after we harvest the honey our kitty cat Kisa stepped right in a puddle of honey and it was hilarious. No worries, we cleaned her up promptly as she was in such distress. I always make jokes that I am the beekeeper’s assistant and here I am below extracting the honey, but I must admit my role was a lot easier this year since we ditched the brush the bees away method that we have done in the past and overall the hive we were dealing with is pretty gentle so that’s a bonus! Some reminders about helping the bees! Make sure to plant flowers that the bees like, join a beekeeping group even if you don’t keep bees to stay current on what is going on with our lovely pollinators. Here is the link to our Facebook group Help The Beez Pleez! Without the bees we don’t have a future and they need our help and they need us to be good stewards such as we leave quite a bit of honey for our bees to survive the winter. Remember to join a local beekeeping club and help your fellow beekeepers too. Knowledge is truly empowering! This year I did realize that it may be time to finally purchase a new smoker. I found a nice one on Amazon here that I am thinking about purchasing for our beekeeping supplies. It’s always a good time before the honey harvest to check on your equipment and supplies. We realized we could make it for one more season with this smoker but I think after the fall it will be no longer functional. I have a couple of posts I can’t wait to share with you and my schedule should become less intense soon so I am hoping to get some great information to all of you soon! I finally have the before and after pictures of our kitchen going from the 80’s oak cabinets to white. I am so excited to share our kitchen reveal and what can be done on a budget. We don’t have honey for sale at our etsy store right now as we basically sold out as soon as we harvested but we do have lip balms for sale click here if you would like to purchase some! I am continually getting feedback from folks about how much they love it! We tell people all the time it’s for lips, elbows, and even your heels so give it a try! I have loved sharing with all of you about our honey harvest and Brian’s fabulous photography and I hope you enjoyed it too. I wish you all a beautiful week…until next time! 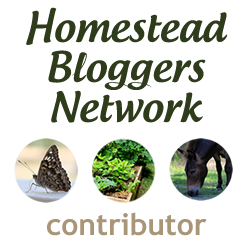 thank you for sharing your experiences in homesteading! Emily, thank you so much for stopping in and I will have to stop in and visit soon! Good luck with your beekeeping! This is my first year with bees. They’re still building comb and stores for winter so we won’t get a harvest this year. I’m very much hoping they make it through winter; next year should be our first honey harvest. Thanks for sharing the almond oil tip! Emma, I cannot wait to hear more! I’m so happy for you…please keep us posted and I am so happy to pass on anything we learn along the way!